Captain Marvel just became the 38th movie to gross more than $1B at the box office. It is the first female led superhero movie to do so. I think the film has the potential to finish as one of the top-25 films of all time at the box office. This success bodes well for the upcoming Avenger Infinity War 2 film and for Disney's studio's chances at a record breaking year in 2019. It’s official: Captain Marvel has crossed the $1B threshold at the box office. In the film, the line “higher, further, faster” was used by the protagonist to represent the drive it took for her to overcome various obstacles put in front of her. Many of these obstacles came in the form of a patriarchal system that female pilots had to overcome in the U.S. Air Force in the early 1990s. Well, Captain Marvel (Brie Larson) continues to break through gender barriers with this box office total. Captain Marvel has surpassed Wonder Woman as the highest grossing superhero flick with a female lead and is now one of only a handful of movies ever produced with a female lead to cross the $1B sales threshold. This film is also only the second out of the 38 films to have reached the $1B threshold at the box office to be directed by a woman (Captain Marvel was directed by Anna Boden and Ryan Fleck). The first was also a Disney (NYSE:DIS) movie: Frozen, which raked in nearly $1.3B back in 2013 (Frozen was directed by Jennifer Lee and Chris Buck). Right now, Captain Marvel is ranked 38th on the all-time box office list. I think the film has potential to continue to climb, though, and I wouldn’t be surprised to see it end up somewhere in the top 25. To do that, it would have to amass more than $1.084B in ticket sales, which would move it ahead of The Dark Knight Rises, which currently holds the number 25 spot. Disney has seen a lot of success recently at the box office with female leads. I suppose you could say that Frozen really got things going with its two animated princesses. Then, the new Star Wars trilogy starring Daisy Ridley made history in 2015, becoming just the third movie ever to generate more than $2B at the box office. Emma Watson kept things rolling, starring in Beauty and the Beast, which pulled in $1.26B in 2017. And now, we see Brie Larson breaking down doors in the superhero genre with Captain Marvel becoming one of the most successful origin stories produced to date. I think this trend has legs and DIS will be able to reap the rewards of the strong female characters in its IP universe(s) for years to come. Captain Marvel’s success also shows that the market isn’t experiencing superhero fatigue quite yet. Some have feared that this will be the case for Disney’s big blockbuster platforms. DIS's studios crank out superhero movies all of the time, and with the recent debacle that has led to waning Star Wars interest, some feared that the studio segment’s main cash cow, Marvel, might be next to run dry. In its recent $1B Captain Marvel press release, Disney highlighted the fact that the 21 Marvel Cinematic Universe (MCU) that have been produced to date have generated ~$18.5B at the global box office, which means they’ve averaged ~$880M per film. That $18.5B is just the box office returns. It doesn’t factor in merchandise sales or any other trickle down effect that the superheroes have had on Disney’s other business segments. That’s not bad at all, considering that Disney CEO Bob Iger made the deal to purchase the rights to the majority of the MCU characters for $4.2B back in 2009. I think that Captain Marvel’s success sets up the upcoming Avengers movie which has the ability to become the highest grossing film of all time. Should this be the case, the anti-Marvel thesis should be put to rest. Avengers Infinity War 2 is thought to represent the end of the current chapter of the MCU films. There has been speculation that certain heroes/actors will be phased out, having to be replaced. However, Disney is in no shortage of interesting story lines because of the incredibly in-depth world that was built up with the comic books throughout the years and I continue to have faith that the creative minds at Disney will be captivating audiences with these heroes for years and years to come. As I’ve said before, I think that 2019 is going to be a record year for Disney’s studio division. Captain Marvel’s $1B+ results is a great first step in this process. When you combine the likely success of the studio division with the upcoming Disney+ streaming platform, the ongoing success that ESPN+ is having (which had more than 2 million subscribers at the end of DIS’s most recent quarter), and the integration of the Fox IP assets, I think that it’s clear who the king of content is. Right now, investors can buy Disney shares for just 16.3x earnings. 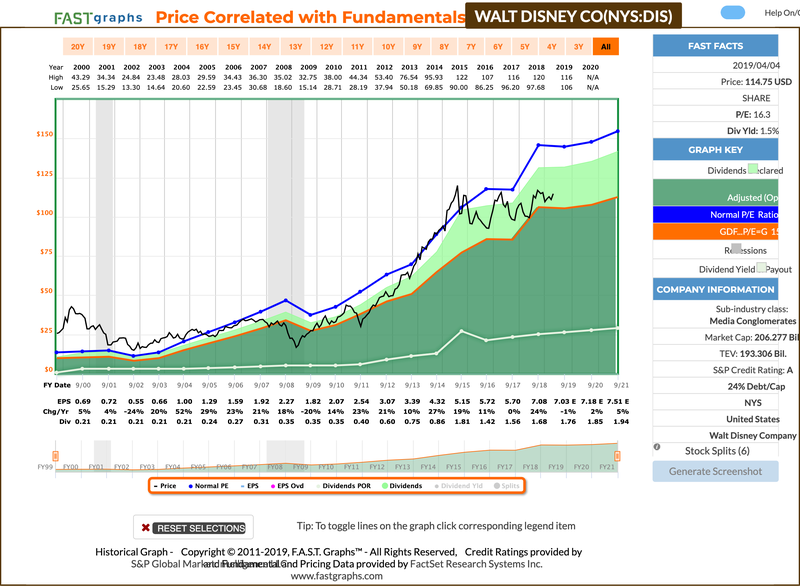 That multiple is well below Disney’s long-term average P/E ratio of nearly 21x earnings. Disney has historically traded at a premium to the market, yet in recent years, we’ve seen the stock underperform because of fears that it was being beaten by more technologically inclined competitors and it might be left behind. I think this relative weakness has created a wonderful buying opportunity for long-term investors. I believe that Iger has stuck around as CEO for a few years longer than many thought he would because he wants to cement his legacy as the greatest media/entertainment CEO of all time. To do that, he needs to assuage any doubts that the market has regarding DIS’s ability to compete in the OTT space. DIS’s valuation is a far cry from 120x premium that investors are currently forced to pay if they want to buy Netflix's (NFLX) stock. Netflix has shown fabulous top-line growth over the last decade or so, that’s for sure. However, Disney remains the much more profitable company of the two. According to Morningstar, in 2018, DIS produced $9.4B in free cash flows, whereas Netflix produced -$2.85B. Disney offers investors a much more diversified business that has a handful of significant revenue streams, and on top of it all, it’s generous to shareholders with a growing dividend and a buyback that had reduced the outstanding share count by nearly 12% from 2014-2018 (prior to the dilution from the Fox deal). I suspect that DIS will continue to be generous with its cash flows moving forward. So, when I combine Disney’s IP, its balance sheet, its fundamental multiples, and its exciting growth prospects moving forward, I can’t help but be really excited about DIS stock’s prospects. DIS is my second largest holding and I have no plans to sell any of the shares that I own anytime soon. If you’re looking for exposure to the media/entertainment space, I think this is a stock worthy of consideration. I know some call Disney a dog, but I'd much rather buy the stock when it's trading below its historical averages than after sentiment changes and the multiples revert back towards the mean. This article was previously published for members of The Dividend Growth Club.